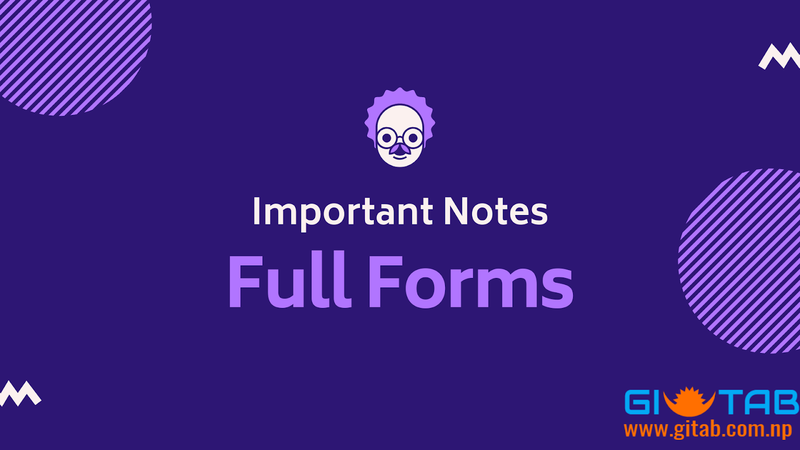 Here are some full forms which may be important for Public Service Commision (Loksewa) examination. ACER: – Acquisition Collaboration Experimentation Reflection. AMOLED: – Active-matrix organic light-emitting diode. APK: – Authenticated public key. APN: – Access Point Name. ATM: – Automated Teller Machine. CDMA: – Code Division Multiple Access. COMPUTER: – Common Oriented Machine Particularly United and used under Technical and Educational Research. DELL: – Digital electronic link library. DIVX: – Digital internet video access. DLNA: – Digital Living Network Alliance. DNSE: – Digital natural sound engine. DVD: – Digital Video Disk. EDGE: – Enhanced Data Rates for Globa Evolution. ESN: – Electronic Serial Number. GOOGLE: – Global Organization Of Oriented Group Language Of Earth. GPRS: – General Packet Radio Service. GPS: – Global Positioning System. GSM: – Global System for Mobile Communications. HDMI: – High-Definition Multimedia Interface. HSDPA: – High-speed downlink packet access. HSPA: – High-Speed Packet Access. HSUPA: – High-Speed Uplink Packet Access. IMEI: – International Mobile Equipment Identity. IVRS: – Interactive Voice Response System. J2ME: – Java 2 micro edition. LCD: – Liquid Crystal Display. MPEG: – moving pictures experts group. OLED: – Organic light-emitting diode. OVI: – Ohio Video Intranet. POI: – Point of interest. PAN: – permanent account number. PDF: – portable document format. PPI: – Pixels Per Inch. QVGA: – Quarter Video Graphics Array. RAM: – Random access memory. RSS: – Really simple syndication. SIM: – Subscriber Identity Module. S-LCD: – Super Liquid Crystal Display. SNS: – Social network service. TFT: – Thin film transistor. UMTS: – Universal Mobile Telecommunications System. UPS: – Uninterruptible power supply. USB: – Universal Serial Bus. VGA: – Video Graphics Array. VIRUS: – Vital Information Resources Under Siege. VPN: – Virtual private network. WCDMA: – Wideband Code Division Multiple Access. WINDOWS: – Wide Interactive Network Development for Office Work Solution. WLAN: – Wireless Local Area Network. WVGA: – Wide video graphics array. WXGA: – Widescreen Extended Graphics Array. YAHOO: – Yet Another Hierarchical Officious Oracle.